Update: I have decided to update this post with the name of the company that supplied the poor quality prints: Maxmini3D.eu. I'm doing this so as not to cast doubt on companies that may offer similar services. I feel what is written below is a fair review of the service and product supplied by Maxmini and a fair comparison with the Envisiontec Perfactory prints. Update 2: In light of my criticism of Maxmini's quality control, I thought it appropriate to show the initial castings I received from them. When I have the chance, I will add photos of all the replacement castings. Update 3 12/09/2013: Perhaps not surprisingly, Maxmini do not feel inclined to issue a partial refund, finally replying after 3 weeks and 3 emails. Their reasoning for this is the damage done by this blog post to their 'brand image' . They state 'after you decided to write such a post you already have your payment for "loss". It is satisfaction'. They assert I should have waited for the matter to be resolved before writing such a blog post, ignoring the fact that the main subject of the post is the defective replacements sent out following the first batch of defective parts - they had their chance. I cannot be held responsible for any negative effect on Maxmini's brand: they are responsible for that, firstly when they sent such obviously faulty and incorrect parts, but more damningly when they repeated the quality control failure with the replacements. Update 5 13/09/2013: Now it's the final update! Maxmini have now issued a refund for the fault parts. Apparently steps have also been taken to avoid a similar situation in future. It's over a year now since I had my first digitally sculpted figures printed, moulded, cast and put on sale. Obviously, I was a traditional sculptor prior to going digital, so I think I hit the ground running in regards to knowing what exaggerations and level of detail I had to sculpt to in order for the detail to be viable for the final casting. Still, I've learned a lot in the past year and keep striving to make each figure better than the last. Until recently, I had used a single 3D print bureau, Timolaumann.de, who have provided excellent service and great prints. The specific printer used is a Envisiontec Perfactory machine, printing a temperature resistant resin. One of the quirks of this method and material is the support structure attached to the figure during the printing process. This has to be removed and leaves little pegs that need cleaning off with a sharp scalpel, perhaps some areas need to be fixed with putty. It is probably a wee bit more involved than cleaning mould lines on a metal or resin figure, which makes me glad I used to sculpt figures by hand - I can easily do what is required. No 3D printing process is entirely free of hand finishing if best results are required. For a recent batch of files, I tried out an alternative print bureau, Maxmini3D.eu. In contrast to the company I used previously, whom I believe mostly work in the jewelry industry, Maxmini3D is specifically targeted at miniatures manufacture. Firstly, I should say the quote from Maxmini3D was significantly lower than what I had been used to with my usual bureau. I will admit this worried me, though I did not voice my concerns. 3D prints are created by building up layers. The taller the part is in it's z axis, the longer it will take to print and therefore the greater the price. However, the z-axis layer depth is usually greater than x/y resolution. This means if you were to print a sphere, there would be some slight 'contour lines' on the top and bottom of the sphere, but not on the sides. These contours tend to show on shallow curved surfaces nearing the horizontal. It's part of the 3D printing deal and something I fix by hand on the physical print - it can be scrapped off as you would remove a mould line. Because the contours appear on the top and bottom surfaces, I've found it best for figures to be printed in a 'standing' position, as the final casting would be assembled. That way, any contours only appear on the top and bottom of a figure, a smaller area than the sides of the figure. It also allows greater depth and definition in a face and figure details - if you were to slice your nose into horizontal slices, there would be more slices than if you sliced your nose into vertical slices... Therefore there is more defined detail if the head is printed where the z-axis is the height of the head. So getting back to the quote, that is why the Maxmini3D quote was cheaper than I was used to - they printed the figures lying flat on their backs and the heads likewise. It saved time and saved me money, but at the expense of quality. I had supplied the figure orientated in an upright position as I hoped they would be printed. It was the printer's decision to save some time and money. However, I'm actually glad I didn't insist on the parts being printed vertically, which I'll get to later. Now, whereas my previous prints have been resin, Maxmini3D prints in wax. This has the advantage that the support material is not physically attached to the print; it can be removed without leaving the tabs and imperfections you would get with a Perfactory resin print. This is the reason I was interested in trying new processes. However, wax prints do not suit my moulding methods, nor those of the rest of the miniatures industry, so Maxmini3D provide resin casts of the prints. This is included in the price. Sounds like a good deal, no? Well, it would be if the resin casts were accurate, well-made representations of the files I provided to the printers. I would not expect any distortion or squashed detail and I would expect minimal mould lines and complete parts. My expectations were not met. Below is a photograph of two of the replacement parts sent by the Maxmini, alongside a print supplied by Timo Laumann. These were made from the same file. I left the support tabs on the Perfactory (orange) print so it is a fair comparison. Admittedly, I was sent several cast of each part, but as they are all poor quality, that doesn't help much. L-R: Maxmini resin cast of wax print, Timo Laumann Perfactory Resin Print, Maxmini resin cast of wax print. The photograph doesn't quite show the startling difference in definition and detail depth. It really is striking in the hand. But as I explained, some of that is probably to be expected due to the orientation of the prints when they were being made. You get what you pay for in this case. What I really do object to it the level of distortion in the face. I don't know at what stage this occurred - perhaps the wax print was squashed - but it is totally unacceptable. Just look at her face on the left and right casts! That is not even close to what I sculpted. It seems the pegs attaching the parts to the sprue have also been thickened by Maxmini3D. This has resulted in the gun barrels ends no longer being straight. I assume this was done due to avoid breakage during the printing and moulding for the resin casts. However, I specifically asked if the files as they were supplied were suitable for the company's needs. I was told they were. If they had asked me, I could have thickened the pegs myself and would have done it properly. As supplied, the casts are not suitable for my needs. There are other bizarre examples of distortion, too. Several of the 'helmets' are no longer symmetrical, with visor slits at different heights on either side. I cannot fathom how this happened. Certainly not due to a misaligned mould - the mould line does not bisect the visor slits! Left: Some of the first batch of castings. Note the distorted faces and broken parts. Right: Some of the replacement castings. Note the distorted faces and crudely 'fixed' parts. The quality of the resin castings also leaves something to be desired. I struggled to find any casts that did not feature heavy, ragged mould lines. In addition, all the initial castings I received did not even feature complete base tabs. They just hadn't been filled with resin. 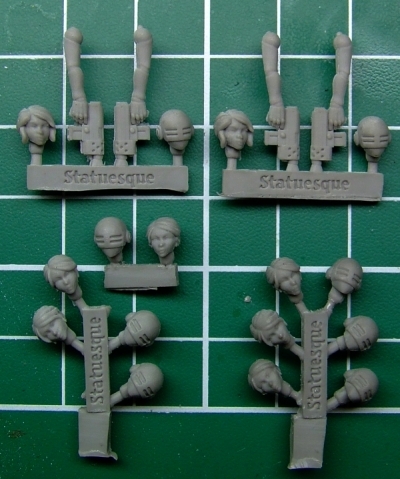 Finally, one of the head sprues had been broken at the print stage and instead of reprinting the part, they had crudely attached the heads to another sprue and moulded that. To their credit, Maxmini3D sent replacement casts and a reprinted, remoulded head sprue [edit: my mistake, the sprue was not reprinted, the broken heads were simply stuck back on with superglue...]. Well done on that, but the replacements are still obviously useless. The initial castings supplied by Maxmini. 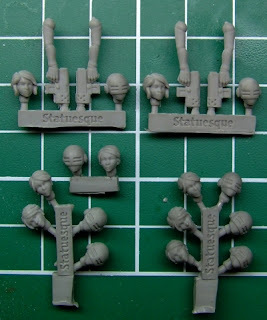 Note that none of the base tabs are filled completely and how the detached heads have been attached to a second sprue. I supply files as I expect them to be printed - this is not optional! Sadly, all this has taken nearly four weeks, delaying the next set of releases and ultimately costing me more in terms of cash flow than just the cost of some bad prints. I have requested a part refund on the distorted, useless parts. Note I've not asked for a full refund as I accept you get what you pay for - cheap prints will always be poor quality, but I cannot accept distorted parts. We shall see how far that gets. This is why I say I'm glad I didn't insist on the parts being printed vertically. If I had they would have cost me far more and while the detail may have been slightly better (I'm not convinced it would have ever matched the Perfactory print), the distortion and bad resin casts would still have meant the parts were useless. But I have had the parts reprinted by my original printer and now they shall go off for master moulding on Monday. In future, I think I shall stick to what I know. I have a very good, reliable print bureau and likewise a very good, reliable moulding and casting company. Statuesque Miniatures shall continue to sell the high quality figures my customers have come to expect. Of the companies using substandard print bureaus, I cannot say likewise. Interesting post. Glad you're sticking to your original guy! Hey Andrew, sorry to hear about the troubles. Glad to know that you have a way and the means to sort it out though. Far be it from me to suggest you burn bridges, but maybe you should name the "miniatures" print shop? I bet I know who it was, and would love to have confirmation, so I can avoid the same problems you ran into. I am starting to get into Zbrush, and was hoping to have some pieces printed, eventually. I would love for you to take a look at my work (when it is closer to finished, lol) and give me some tips if you have the time. Sad to hear of your woes, There is quite large difference in detail in the photo's so if its comes across worse in the flesh crikey! Hope you get some cash back. Glad you go for quality over cost! Ouch, those are very badly distorted. Hopefully you get some form of recompense! If I ever get back to my early plans to learn digital sculpting, I shall give your preferred company a go as that print is much much nicer! Andy (heresy) linked me to this from Twitter, I didn’t even know you had stopped sculpting by hand tbh! I’m going to have to disagree with the later part of your statement Andrew - wax prints can be used and moulded easily enough as-is and investment-casting (into metal) is hardly new or unusual. It may be outside of what you or Griffin moulds (or whoever you use to cast) can do, but it’s not rare or unusual in itself. Plus its standard-practice in the jewellery trade and in studio work... not to mention having been done regularly in the miniatures industry for at least 6 years… perhaps outside of your personal experience but certainly it isn’t unusual across the globe for miniatures companies (just look at Ninja-Magic who’ve been doing it for years and I think our first investment-cast wax print was 5 years back via them… and subsequently with other companies running that service for miniatures companies in the USA and Europe and in the UK)…. So “Nor those of the rest of the miniatures industry” may be accurate on certain forums, but bear in mind those forums aren’t the entire industry. But, in any case, the print being in wax isn’t the issue here. What seems more likely to me is that their printer has gone out of alignment or a motor is slipping: I believe that this is the case because I also have prints from max-mini that are ‘bad’ - in my case the part was, essentially, a cube. The vertical edges on the 15mm-square cube are almost 1+mm out of alignment from base to top, slanting the entire cube at an obvious angle on the Y-axis. I am awaiting a re-print in high-quality (which will not have any stepping visible on the Z) to see what occurs; but the casts sent to me were unusable as they stand, due to the slip on the Y-axis and the lower-quality print-stepping on the Z. A somewhat separate issue is their moulding/casting ability. I've recently had a couple of parts from them with poorly positioned seams on them, as if the moulds/casts were done rushed or with little thought to the placement of seams when splitting the moulds. I’ve had the seam running along a natural edge then slanting off, going over a flat surface (leaving an obvious mark) running back up to the edge, then down the other side over smooth areas again: Far from ideal. Perhaps it isnt always the same person doing the moulding/casting. We use 3 different print studios, who gets used depending on the job and the individual requirement of each print, each one on a different machine using a different material… as sometimes you just don’t need the best print quality… Because sometimes it faster/easier/cheaper to print in a lower quality and finish the parts by-hand. As rule of thumb though whenever you get a significantly cheaper print you are pretty much ensuring that you will need to do more “polishing” by hand yourself. Hi, thanks for your input. Of course I know about investment casting, however, the priority for me is a trouble-free, fast production method. At this time, I do not have the time or money to investigate alternatives. It was enough of a risk to try out Maxmini. I suspected the cheaper price would lead to a reduced quality, but I feel in this case the experiment has been worth it if only to rule out using Maxmini in the future. Given all the additional issues, I do not feel a simple change of orientation in the print - which would mean the price would likely be much closer to that of Timo - would lead to a print that satisfies my requirements. Also, I understand that the quality seen above isn't representative of the quality Maxmini's printer *should* be capable of. However, the photo shows one of the replacements for the initial castings they sent me. I informed them of all the issues with the first castings and they did not rectify these problems. All the parts should have been reprinted and if there is indeed a problem with their printer, they should have fixed that first. Simply sending more bad castings doesn't help me at all. There appears to be a serious lack of quality control at Maxmini. I rechecked my emails and it was actually July 15th when I uploaded the files to Maxmini. Had I used my usual bureau, I would likely have received the prints within a week. Additionally, despite the need to clean support tags, for me Perfactory resin prints seem to be the most direct route to production: Resin print to metal master casting to metal production casting. All print methods require some hand finishing, so I'd rather do that on a resin print than on a resin copy of a wax print, or on multiple copies from investment casting. All moulding and casting reduces the fidelity of the part therefore I feel it best to minimise this. """Given all the additional issues, I do not feel a simple change of orientation in the print - which would mean the price would likely be much closer to that of Timo - would lead to a print that satisfies my requirements.""" I agree with you Andrew - the Perfactory print is better anyway, regardless of the other issues being solved in any case. Solidscape wax prints at High-Quality settings were the best you could get.. but that was going back 4-5 years. The competition has caught up and overtaken them recently...AND with "better" materials from the miniatures-market perspective anyway. The big drawback with investment is the need for a large gate..which, again, doesn't sit well on a finely detailed figure...and metal is much harder to "polish" than resin. I don't think you are being fussy and you gave them a fair crack at the work: it just wasnt up to standard even if done correctly. Thanks for this insightful post into your 3d printing methods. Is this the same maxmini that makes their own miniatures? If it is, then isn't there something of a conflict of interests here as regards their space occupied in the miniatures market? It's the same people. What do you mean by conflict of interest? Purely in terms of they have a place in the miniatures market, why would they allow a competitor a foothold in that marketplace? I got Bella the Partisan from you guys, top quality mini, I am sure you guys could do the best with production :) look forward to new miniatures from you guys~! The quality he delivers is quite excellent, do you cast the models afterwards? I'm quite curious about this since I've been working on some stuff I need prototypes printed of for casting. Some people over at the Resin Addicts forum recommended I should check out with you, since you're quite experienced in it and have some really high quality miniatures. Yeah, I'm still using Timo after the Maxmini experiment. MicroRP is the same company, I believe. Don't know why they have two addresses. I have the prints moulded by Griffin Moulds Ltd using a silicone rubber mould for metal master castings which are then moulded in black rubber for metal production castings. I'm very tempted to go for Timo, his work is really excellent! Which material do use for printing? He recommened RCP30 or HTM140. Thing is that he's quite pricy, which I don't mind. But I'm working on space ship designs, which are bigger than 28mm scale miniatures (current dimensions are 11mm x 24mm x 98mm), meaning the price can really go up. For miniatures, I found HTM140 very, very brittle. I managed to break one part and didn't want to risk a failure in the mould so had other parts reprinted in RCP30. If it wasn't so brittle HTM140 would be great as it could be moulded in black rubber, but I just don't trust small parts to survive the moulding process. I would only use Perfactory for 28mm figures but perhaps for your space ships, you could try wax prints. I guess it depends how detailed they are and what kind of detail it is. If the detail is bold enough you could do more work post print to get things up to scatch. The lack of support tabs with a wax print would also be an advantage over Perfactory for a vehicle design. Drop Alan Crookes at Black Dragon Castings an email - he does wax printing. I'm very tempted to go for RCP30, it will survive the moulding process to make a master. I've contacted Alan, really love his work as well. But isn't wax very soft? I mean, wouldn't it go all messy when I touch it? Alan will be able to make a resin cast for you. With the right resin, it could be put into a black rubber mould. lol i was about to test max mini..
Hi Braprus, sorry about the late reply. Perfactory machines can print in wax but I've never seen one so can't comment on those. I like the resin prints because they're strong and easy to work with. If you want to keep the original, you could make a resin copy which would go into the black rubber mould. I'm going to this method so the prints aren't destroyed. The resin is Biresin suitable for vulcanization. Since the print won't be vulcanized, RCP30 probably isn't necessary, being a temperature resistance resin, so another Perfactory resin could be used. Regarding the miniature, I think the details are a bit shallow for a miniatures. A lot of it would be very faint on a print.